Problem statement. The use of existing and the most widespread drives (wheeled and caterpillar one) is sometimes limited by complicated operational conditions while moving on rough terrain. The mentioned drives require a relatively flat surface to be operated effectively. A rocky or a hilly terrain imposes the demand of the use of alternative types of drives, in particular, walking ones. Purpose. In this paper, there will be proposed and analysed one of the possible structures of the walking mechanism for mobile robotic system to be used on rough terrain. Methodology. While carrying out the investigations, the structural and kinematic synthesis of the eight-bar hinge-lever walking mechanism has been performed using the well-known methods of the Theory of Machines and Mechanisms, in particular, the method of closed vector loops. In order to conduct experimental investigations and simulation of the mechanism motion, the applied software SolidWorks and MapleSim has been used. Findings (results). The structure and geometrical parameters of the eight-bar walking mechanism have been synthesized with the aim to ensure the required trajectory and kinematic characteristics of the supporting foot motion. Originality (novelty). The analytical dependencies describing the trajectory of each hinge of the analysed walking mechanism have been derived and the kinematic optimization synthesis problem has been solved. This allowed to substantiate of the mechanism’s geometrical parameters and to analyse its kinematic characteristics. Practical value. The proposed structure of the walking mechanism can be effectively used in various mobile robotic systems and in transporting and technological machines in order to ensure the possibility of their use on rough terrain where there is no ability to use wheeled and caterpillar drives. Scopes of further investigations. While carrying out further research, it is necessary to analyse the influence of the weight coefficients on the solution of the optimization problem, as well as to take into account the necessity of changing the step length and the foot lifting height during the process of walking according to the surface obstacles sizes. V. Korendiy, “Analysis of Structure and Kinematics of Four-Bar Crank-Rocker Walking Mechanism”, Ukr. J. Mech. Eng. Mater. Sci., vol. 1, no. 2, pp. 21–34, 2015. P. A. Simionescu and I. Tempea, “Kinematic and Kinetostatic Simulation of a Leg Mechanism”, in Proceedings of the 10th World Congress on the Theory of Machines and Mechanisms, 1999, pp. 572–577. W. B. Shieh and L. W. Tsai, “Design and Optimization of Planar Leg Mechanisms Featuring Symmetrical Foot-Point Paths”, University of Maryland, 1996. G. V. P. Babu and N. A. N. Rao, “Design and Analysis of a Low Cost and Easy Operated Leg Mechanism for a Walking Robot”, Int. J. Mech. Ind. Eng., vol. 2, no. 1, pp. 60–64, 2012. A. Aan and M. Heinloo, “Analysis and synthesis of the walking linkage of Theo Jansen with a flywheel”, Agron. Res., vol. 12, no. 2, pp. 657–662, 2014. O. Al-Araidah, W. Batayneh, T. Darabseh, and S. M. BaniHani, “Conceptual design of a single DOF human-like eight-bar leg mechanism”, Jordan J. Mech. Ind. Eng., vol. 5, no. 4, pp. 285–289, 2011. F. Moldovan, V. Dolga, O. Ciontos, and C. Pop, “CAD design and analytical model of a twelve bar walking mechanism”, UPB Sci. Bull. Ser. D Mech. Eng., vol. 73, no. 2, pp. 35–48, 2011. V. M. Korendiy, O. S. Bushko, O. Yu. Kachur, and R. Yu. Skrypnyk, “Rozroblennia krokuiuchoho modulia na osnovi dvokh tsyklovykh rushiiv” [“Developing walking module based on two cycle engines”], Avtomatyzatsiia vyrobnychykh protsesiv u mashynobuduvanni ta pryladobuduvanni [Industrial Process Automation in Engineering and Instrumentation], vol. 49, pp. 26–35, 2015. [In Ukrainian]. Ia. T. Kinytskyi, V. O. Kharzhevskyi, and M. V. Marchenko, Teoriia mekhanizmiv i mashyn v systemi Mathcad [Theory of mechanisms and machines in Mathcad system]. Khmelnytskyi, Ukraine: RVTs KhNU Publ., 2014. [In Ukrainian]. J. Collard, “Geometrical and Kinematic Optimization of Closed-Loop Multibody Systems”, Université Catholique de Louvain, 2007. 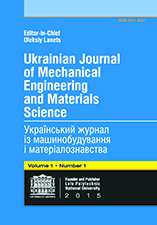 V. Korendiy, "Structural and Kinematic Synthesis of the 1-DOF Eight-Bar Walking Mechanism with Revolute Kinematic Pairs", Ukrainian Journal of Mechanical Engineering and Materials Science, vol. 3, no. 2, pp. 88-102, 2017.